If someone asked you to create a list of every possession in your home today, how many items do you think you’d remember? Think about just one room. Can you envision what’s in every drawer, hanging on each wall, or sitting on the shelves? Under the unfortunate circumstance your home is destroyed, your insurance company will ask for a complete home inventory. Your current insurance contract most likely reads something along the lines of: “Prepare an inventory of damaged personal property showing the quantity, description, actual cash value and amount of loss. Attach all bills, receipts and related documents that justify the figures in the inventory.” In order for you to receive payment to buy new items, you will be required to complete a home inventory. The more detailed your inventory, the better. That being said, don’t make it too complicated. 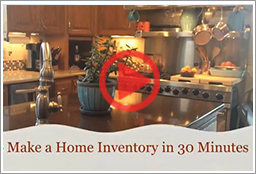 An easy way to do a home inventory is go from room to room, photographing or videotaping the contents of each room, then jotting down descriptions and details. Don’t forget your closets, cupboards, and drawers. And be sure to include the basement and garage. Receipts. If you don't save receipts, it’s a good time to start. More expensive items like jewelry, collections, furs, and other valuables are limited in the amount covered. If the value of these kinds of items exceeds the limits, be sure to insure them separately. You may need appraisals to do this. Once you have an inventory and appraisals, store them in a safe deposit box away from home. Keep your inventory current. Update it every year, especially if you buy, sell, or give away items. Failing to keep your inventory updated could result in not enough (or too much) insurance coverage. Once you’ve got your inventory (whatever form it takes), make sure to protect it. Store it in a safety deposit box, in a strong safe or lockbox, on a cloud storage service, at work, or with a friend. Just make sure it’ll survive if there’s ever major damage to your home. Remember that’s what it’s there for! Having your home inventory complete prior to a loss is highly recommended. The devastation of losing your home and possessions is unthinkable and can cause an incredible amount of stress in itself. Ideally you’ll never need to file a homeowner's insurance claim. However, an updated inventory can make the process faster and easier, and help you get the most from your insurance. It also provides you with peace of mind, knowing all of your possessions will be accounted for. Contact a KnowledgeBroker for more information. With winter fast approaching, there are so many things to do to prepare for the holiday season. Many common preparations, if overlooked, can be dangerous for you and your home. If you are in denial that winter is coming, such as I am, here are some easy to remember tips that will ease you into the winter spirit for keeping your home safe and warm this winter. Climb up on that ladder and check out your roof! Look for any damaged shingles, weak spots, or possible leaks. If your roof is over 10 years old, any of these things could cause a problem for you during the winter. Heavy snows, melting snow, and freezing could cause a number of problems with your roof. If you have to do any repairs, I highly recommend you spend a little money now, to save a lot of money later. 2. While you’re up there—check out your gutters! Clear out your gutters of leaves and debris. These items can get stuck in your gutters and cause major blockages, which could lead to roof and water damage. Check the gutters for any leaks that could lead to dangerous ice and icicle buildups. It is also recommended that you add extensions to your downspouts that lead away from the foundation. This could prevent any freezing of drainage water at your foundation, and therefore prevent further damage in the future. Mulch leaves into your lawn instead of raking them- this helps to nourish and maintain your fantastic-looking lawn even when it is covering by snow. Turn off all outside water faucets- this can help prevent freezing of these water sources, and could prevent bursting of pipes during those deep-freezes. Drain any lawn irrigation or sprinkler systems- this will save you the trouble of thawing out your sprinkler system in the spring! Don’t give me that look like I am nuts, this actually helps keep your house warmer! If you are looking up at the fan, during the winter it should be rotating clockwise. This way, the fan will push down heated air that has risen to the ceiling. This could also even allow you to turn down the thermostat a few degrees, which could save you some money! 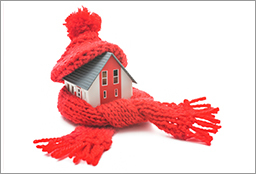 Keep the chills away and outside by sealing off any drafts in your windows and underneath doors. Any drafts you do find can be sealed off using caulk or storm windows on the windows, and draft stoppers at the bottom of doors. This could also save you money, as it should keep your house warmer as well! Have a professional come and take a look at your furnace. Get the furnace cleaned and inspected to ensure that it will work properly throughout the winter. Stock up on furnace filters and replace the filter monthly. This will ensure maximum performance of your furnace through the coldest of winter days. Also, as a precaution, remove any flammable substances or fabrics away from the furnace, just in case! At the end of your lawn-care days for the year, drain the gas tanks of lawn mowers, weed whackers, and other gardening or lawn equipment. This will prevent the freezing of the gas over the winter, which could lead to irreparable damage when the winter is over. Make sure to service or replace any snow removal equipment. This includes snow blowers, shovels, ice-melt, sand, and ice scrapers. This will ensure you are ready to take on the snow with a vengeance until the summer months return. Don’t wait until the last minute to do this, as these items seem to disappear out of any and all stores after the first snow storm of the year. According to the National Fire Protection Association, almost two-thirds of home fire deaths are a result of fires in homes with inoperable smoke alarms, or no smoke alarms are present. Be sure to change or check the batteries in your smoke detectors (you might as well check those Carbon Monoxide detectors I mentioned earlier, too!). Do this at least twice per year. I would recommend doing this now, while you are preparing for fall and winter, and again when doing your spring cleaning. All of these tips can help you conquer the winter with no problems! So after this list is done, bundle up, keep warm, and wait out the winter until spring gets here! About the author: Lauren is an R&R Insurance intern learning about the insurance industry through sales and service experiences. We talked about a great article we came across by Jim Guidry of the Wisconsin Office of the Commissioner of Insurance that talked about a way to protect your personal property by using your iPhone® or iPad®, he also gave some pointers on how to complete a home inventory. (Hint) A suggestion from our staff is to hire your teenager to do this for you. Make a list of possessions, including "celebration" purchases, such as jewelry and fine art. Think about family heirlooms, collections and furniture. Also, consider items related to everyday leisure time, from flat-screen televisions to custom guitars. Take note of commonplace items such as toys, CDs and clothing. Do not forget items you may only use occasionally such as holiday decorations, sports equipment, tools, and high-ticket items kept outside your home such as landscape and swing sets. Attach copies of original sales receipts and/or appraisal documents to your inventory. Be sure to note model and serial numbers. Remember to open drawers and closets to document what is inside. Store your home inventory and related documents in a safe, easily accessible place, such as a secured site/file online, a fire-proof box or in a safe deposit box. You may want to share a copy with your insurance provider to make necessary updates to your coverage. Review and update your inventory annually and anytime you make a significant purchase. More information on home inventories can be found on our website. Wisconsin residents who have more questions on home inventory or homeowners insurance, please contact KnowledgeBroker, Dan Wolfgram.